The Sugar Hill Gang, known as the first nationally popular African American hip-hop group, comprised three members: Mike Wright (Wonder Mike), Henry Jackson (Big Bank Hank), and Guy O’ Brien (Master Gee), all from Englewood, New Jersey. The group is best known for its 1979 hit single, “Rapper’s Delight,” which was also the first hip hop single to rank in the top 40 hits and to become part of a multi-platinum selling album. Rapper’s Delight is also credited with popularizing hip hop as a new musical genre. With a recording contract and air time on radio stations, the group easily became the most popular hip hop group in the country. In 1979 they also became the first hip hop group to perform on American Bandstand. At the time “Rapper’s Delight” was ranked #36 hit on the U.S. pop chart and #4 on the Rhythm & Blues chart. The lyrics to “Rapper’s Delight” sung by Big Bank Hank, were originally written by Grandmaster Caz, a former hip hop artist for Chic records. However, Grandmaster Caz did not receive any royalties for this. A lawsuit filed by Chic’s Nile Rodgers for copyright infringement was settled out of court in 1979. Although “Rapper’s Delight” was an instant hit, the Sugar Hill Gang would never reach the top of the charts again. They released three albums: Sugar Hill Gang (1980), 8th Wonder (1982) and Jump on It (1999). Although considered to be a one hit wonder group, the Sugar Hill Gang opened doors for African Americans into the music industry through hip hop, a genre today dominated by African Americans. “Rapper’s Delight” is still a major influence today. Rolling Stone Magazines ranked it #248 of the 500 Greatest Songs of All Time. The group continues to tour today. 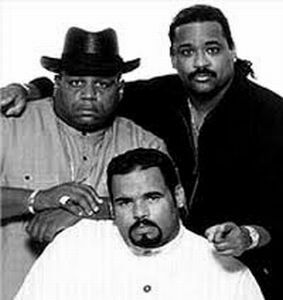 Sugar Hill Gang Biography: www.oldschoolhiphop.com/artists/emcees/sugarhillgang.htm;http://www.oldschoolhiphop.com/features/rappersdelight.htm; http://www.billboard.com/bbcom/bio/index.jsp?pid=331365; http://new.music.yahoo.com/sugarhillang/biography/www.starpulse.com/Music/Sugarhill/Gang.